Cardinal Pietro Parolin, Vatican Secretary of State returned from a four-day state visit to Russia yesterday. In a Vatican Radio report, Cardinal Parolin said Pope Francis “was pleased with the impressions and positive results which I shared with him… The Pope as we know – and as he repeated also in this instance – is very, very attentive to all possible occasions for dialogue. He is very attentive to evaluating all existing occasions for dialogue, and he is very happy when steps forward are made in this direction,” he said. During his visit, Cardinal Parolin met with civil authorities, including President Vladimir Putin and Foreign Minister Sergej Lavrov, as well as with Russian Orthodox leaders Patriarch Kirill and Metropolitan Hilarion. 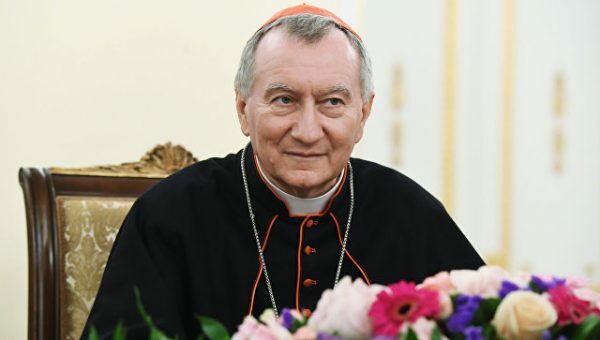 Cardinal Parolin told Vatican media his meeting with Patriarch Kirill took place in “the new climate established in recent years”, beginning with the 2016 meeting between Pope Francis and Patriarch Kirill in Havana, Cuba. “We spoke a little about this new climate or atmosphere, which permeates the relations between the Russian Orthodox Church and the Catholic Church,” he said. Cardinal Parolin said his Orthodox interlocutors were “touched by the faith and religiosity of the people” on display as the relics of St. Nicholas of Myra visited Moscow and St. Petersburg. Some 2.5 million people visited the relics before they were returned to Bari in Italy. Other topics discussed, he said, were ways of taking advantage of this new climate to further improve relations and collaborate on cultural, academic, and humanitarian issues. He said both parties greatly insisted on the need for the two Churches to carry out “incisive and efficacious humanitarian works” in the many situations of conflict around the world. Cardinal Parolin said his meeting with President Putin in Sochi on Wednesday was “a cordial encounter”. He said the two men discussed the conflicts in the Middle East, especially in Syria, and the presence of Christians there. Both Russia and the Holy See, he said, are particularly interested in the theme of persecution of Christians and other minorities. They also discussed the situations in Ukraine and Venezuela, both of which Cardinal Parolin also discussed with Foreign Minister Lavrov on Tuesday. Cardinal Parolin said he presented the Russian president with “several situations of some difficulty for the Catholic community.” His main point, he said, was the desire to transmit the important role Russia has to play in promoting peace. Finally, Cardinal Secretary of State Parolin highlighted three moments, which he found especially touching. The first, he said, “was the beautiful moment of the Mass celebrated with the Catholic community. The Cathedral was packed full of people, and that was somewhat of a surprise since it was a weekday”. He also said he was touched “by the faith and devotion” of the people and by their “attachment to the Pope”. Lastly, he mentioned his visit to the Orthodox Cathedral of Christ the Saviour in Moscow.